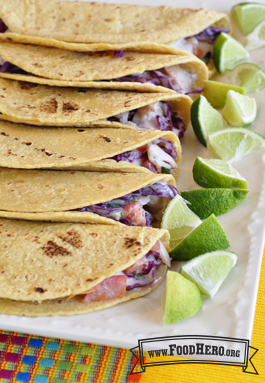 2 Comments for "Fish Tacos"
Tastes great and so easy!! Ate the leftovers the next day and they tasted great! We did add some canned chiles to the baked fish and a tad of ranch dressing to the slaw. Also green cabbage was on sale so we used it instead. Will make again and again. Tacos had a really nice vrunchy texture to them. I warmed up the tortillas first and they tasted amazing!